With so many parades, block parties, and other events; St. Patrick’s Day in New Orleans is a one-of-a-kind experience! We’re thrilled you’ll be here to share it with us. While you’re in town, take time to experience the best our city has to offer. ExperienceNewOrleans.com is a tourist’s dream guide. The site includes information about events throughout the city, offers helpful hints including the best ways to get around town, and features popular attractions. NewOrleansRestaurants.com is a foodie’s guide to paradise in a city known for delicious cuisine. It lists the best of New Orleans from fine dining to casual eating. Whether you need suggestions for your rehearsal dinner or reception or just want to grab a bite, the locals who run the site can point you in the right direction. With so many options, choosing the best hotel can be tricky, but BestNewOrleansHotels.com can make it easier. It’s a guide created by locals for visitors to the city. They’ll help you navigate through the best boutique hotels, B&Bs, and other favorites. Bringing a big group? No problem- they have a group request form so you can get quotes from a number of hotels quickly and easily. The Big Easy offers so many amazing and fun things to see and do, but that doesn’t mean you have to break the bank. Enjoy great savings on some of the most popular attractions while you’re in town with NewOrleansCoupons.com. 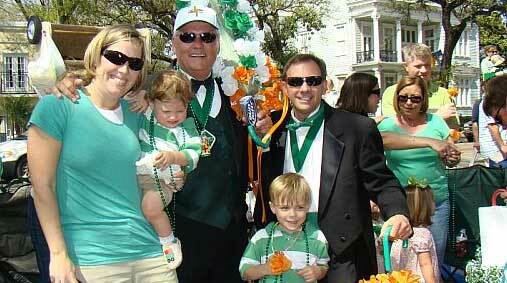 New Orleans and our St. Patrick’s Day parades are family-friendly affairs. So if you’re looking for activities even the youngest members will enjoy visit NewOrleansKids.com to learn about kid friendly tours and attractions.